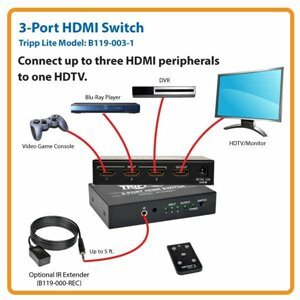 Tripp Lite's 3-to-1 HDMI switch allows you to effortlessly switch between three HDMI video source devices such as HD satellite box, HD-DVD, Sony PS3, etc., to one HDTV. The unit supports 1.65Gbps signal rates. Display HD video resolutions up to 1080p, and computer video resolutions up to 1920 x 1200. Switch between devices with either a pushbutton on the unit or the included remote control. Supports both audio and video digital signals. Tripp Lite’s B119-003-1 HDMI switch allows you to connect 3 audio/video components to a single HDMI input on an HDTV, HDMI-enabled monitor, or projector. It’s perfect for adding additional HDMI sources when you run out of HDMI inputs, especially for computer monitors that may have only a single HDMI input to start with. You can connect DVRs, cable/satellite receivers, DVD players, Blu-ray players, home theater systems, video game consoles, streaming media players, computers, or any other component with an HDMI output. Select between components with the switch’s front-panel button or the included IR remote control. The switch supports the latest HDMI standards and HD resolutions up to 1080p. It is backed by a 3-year product warranty. The B119-003-1 HDMI switch is easy to set up and does not require installing any software or drivers. Simply connect the switch to your HDTV or display with a user-supplied HDMI cable, connect your HDMI source components to the switch with user-supplied HDMI cables, and plug the switch’s universal AC adapter into a standard outlet. The B119-003-1 HDMI switch supports video resolutions up to 1080p with 36-bit deep color (12-bits per channel), including high-speed HDMI and 3D. The switch is also HDCP- and EDID-compatible and supports a wide range of popular audio standards, including DTS-HD, Dolby True HD, and 7.1 channel surround sound. You can choose between components connected to the switch by pressing the front-panel selection button or you can use the included IR remote control. If you prefer to use your own universal remote control, you can use the included remote to “teach” the commands to your universal remote, provided it has a learning function. The selected source is indicated on the switch’s LEDs. Whether you consider your audio/video equipment to be essential to your home theater’s décor or prefer to keep it hidden inside a cabinet, an HDMI switch is a utilitarian component that most people would prefer to keep out of sight if possible. But placing the switch inside a cabinet can block the IR signal from the remote control. By connecting the optional B119-000-REC IR extender to the IR port of your HDMI switch, you can add an additional IR receiver up to 5 feet away from the switch. This allows you to house the switch out of sight inside a cabinet and still place an IR receiver within your remote control’s line of sight for dependable control. The IR receiver is small and unobtrusive, so it’s unlikely to interfere with your décor. The B119-003-1 HDMI switch’s connectors and internal components are manufactured using high-quality materials suitable for demanding applications, such as home theaters, digital signage, meeting rooms, classrooms, and commercial/retail settings. The HDMI connectors are gold-plated to provide superior conductivity and reduce oxidation that can impair signal transfer. The switch is housed in a durable metal case to provide reliable performance and long service life. The switch is RoHS-compliant, which means that it has been manufactured using environmentally responsible methods that reduce or eliminate certain hazardous materials. Tripp Lite is so confident of the switch’s quality, it is backed by a 3-year product warranty. Founded in 1922 in Chicago, Illinois, Tripp Lite is a leading manufacturer of products to power, connect and protect your equipment. With a large selection of connectivity products, Tripp Lite has everything from USB hubs and reversible USB cables to fiber-optic cables and over Cat5e/Cat6 signal extenders. Whether you need to connect high-speed networks to switches, routers and servers in your data center, or send high-resolution video signals to displays and digital signs, Tripp Lite has the complete solution. Plus, before and after your purchase, our Chicago-based, in-house technical support specialists are available to assist you by phone, email and live chat. With 95 years of quality products and service, Tripp Lite is a brand you can trust.